Spread the word, save a life! Top 15 Locals’ Picks for Vegan Food in Whistler, 2018! What’s the difference between a plant-based diet and a vegan diet? Top 15 Locals' Picks for Vegan Food in Whistler, 2018! Earthsave Whistler is a chapter of the non-profit Earthsave Canada. EARTHSAVE CANADA is a registered charity helping people choose foods that benefit our health, the environment, and the lives of all animals. You can make a difference. Visit the Earthsave Canada website. 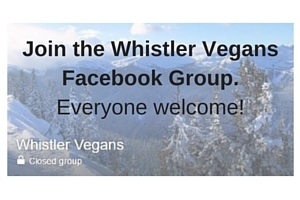 Stay up to date on all the latest plant-based news and events in Whistler and the Sea to Sky. The information contained on this website is for informational purposes only. It is not intended to be a substitute for professional medical advice, diagnosis or treatment. Always seek the advice of your physician or other qualified health care provider before undertaking a new health care regimen.